... or at least stop lying about him and promoting bad research reviews. Around a year ago, a "commissioned and internally peer reviewed" Editorial appeared in the British Medical Journal's off-shoot Open Heart online journal. The author, James J DiNicolantonio is identified as a Cardiovascular research scientist and PharmD, and he is also an Associate Editor of the journal. This is a fledgling online journal conceived in 2013, and it is what I prefer to refer to as a "pay to play" publication. $3000 USD per article to be exact. Here's a suggestion on a format change to demonstrate how dedicated you are to "maximum transparency": under Author Affiliations please list Associate Editor of This Journal!!! This particular Editorial/Review/Article (there really is no distinction where DiNicolantonio's ten or so contributions to Open Heart are concerned), is listed as "commissioned, internally reviewed". So he didn't have to pay to play, and may have been paid. Again, perhaps to "maximize" that transparency, this information should also be included right up front under Author Affiliations, so readers don't have to go looking for it at the end, if they even know it's there. 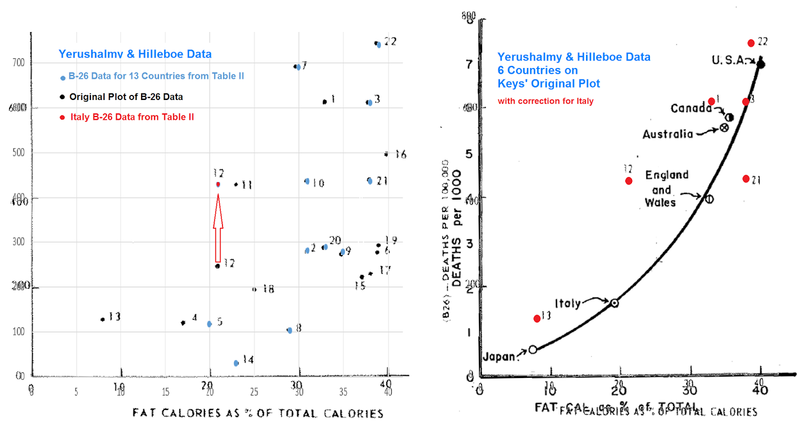 The vilification of saturated fat by Keys  began two decades before the seven countries study, where Keys showed a curvilinear association between fat calories as a percentage of total calories and death from degenerative heart disease from six countries. However, he excluded data from 16 countries that did not fit his hypothesis. Indeed, data were available at the time from 22 countries, and when all countries were looked at the association was greatly diminished. Furthermore, no association existed between dietary fat and mortality from all causes of death. Thus, past data promoted by Keys showing that an increased percentage of fat calories consumed increases the risk of death are not valid (and certainly could never have proved causation). These data seemingly lead us down the wrong “dietary-road” for decades to follow, as pointed out by others. Whatever "vilification of saturated fat" Ancel Keys may have had a scientific hand in during the course of his career, it ABSOLUTELY DID NOT begin with Reference 2: Athersclerosis: A Problem in Newer Public Health ( ← link to full text, free!) I know it's long, but it's an interesting read, far more interesting that Good Calories, Bad Calories. Saturated fat is not even mentioned in that talk/paper. Not even mentioned. Did DiNicolantonio read it? I doubt it. The next two sentences smack of parroting the interpretations of others, and editorial or not, it seems in poor form to start out by impugning the character of a scientist of Keys' caliber. DiNicolantonio joins the ranks of countless others* in advancing the ignorant slander of Keys by one Gary Taubes. It has been implied that Keys willfully excluded data from 16 of 22 countries "that didn't fit his hypothesis". ** Yerushalmy & Hilleboe never leveled such an accusation against Keys, though to be fair, they strongly implied it. At the very least the referencing needed to be more clear to indicate that this statement is DiNicolantonio's opinion (or that of whomever's views he co-opted), not some fact in the evidentiary record. *This link is to an amazing compilation by Seth over at The Science of Nutrition blog. If you haven't read it yet, please do. It might just open your eyes a bit. Let me preface this section by stating that it's been a while since I read some other's work on this topic, so some of this may have already been said, or perhaps I'm even repeating myself. To my recollection, however, many of the points I'm making here have not been made, at least in the same manner, before. If any of this is a repeat, I think it doesn't hurt to do so, but if I'm accidentally cribbing off of you without attribution, please let me know in comments so that I can correct myself and link up to your work! Since no information is given by Keys on how or why the six countries were selected for Fig. 1, it is necessary to investigate the association between dietary fat and heart disease mortality in all countries for which information is available. So far it has been possible to get fully comparable dietary and vital statistics data from 6 countries. 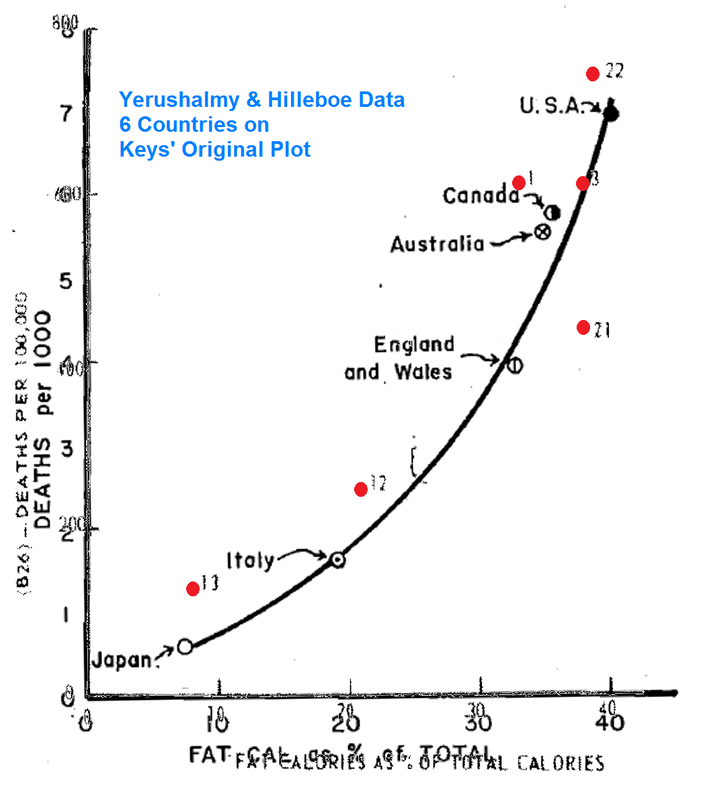 Yerushalmy & Hilleboe's data did not yet exist at the time Keys gave his talk in January of 1953. Why didn't Yerushalmy & Hilleboe use all of the data supposedly available to Ancel Keys from 1948-1949? Keys could not have used and cherry picked from their data, but they could have produced additional data if it were available to Keys. In addition to the years, Yerushalmy and Hilleboe used data from a different classification of heart disease. 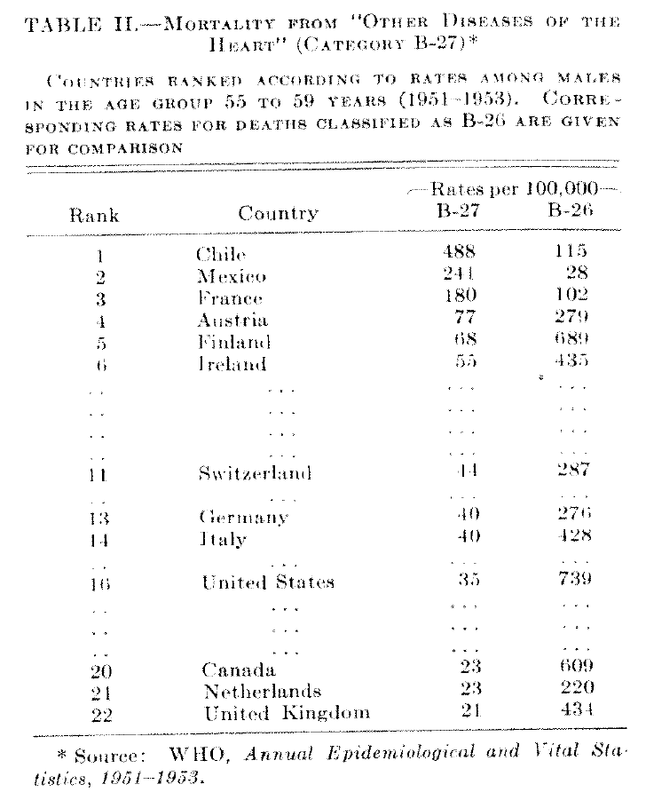 In the caption on Keys' famous graph, he notes that his data is for mortality rates for "Degenerative Heart Disease", and he specifies these are Categories 93 and 94 for 1938 data, and Categories 420 and 422 for 1948 data. Y&H used data from Category B-26. The screenshot at right contains all the pertinent information. For the Keys 6, they show the breakdown of B-26 into subcategories. 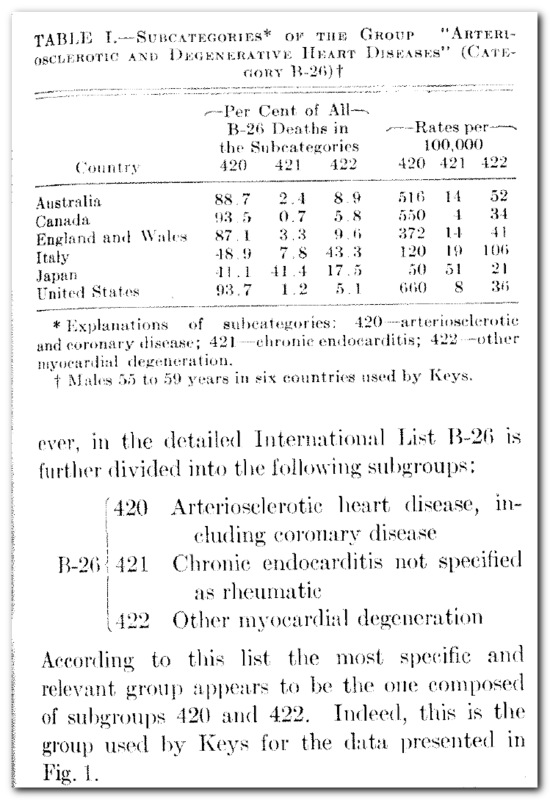 That Keys' data didn't include endocarditis (421) would have made little difference in most cases, but this explains why Japan is higher on Y&H's plot than Keys'. Why didn't Yerushalmy & Hilleboe itemize out the data for the other 16 countries? Perhaps this, too, was not available to A.Ben? We are left without an explanation, despite some rather painstaking detail and "what if" scenarios, as to why Yerushalmy and Hilleboe didn't just use Keys' data if it were available. Of course it would have made sense for them to use the most recent data they could get were the point of their article to present up-to-date information and to discuss/debate the diet-heart hypothesis. But there would have been no reason not to use slightly outdated data to discuss the finer points of statistical correlations ... it would have removed much ambiguity from their discussions. It seems rather the more unconscionable for them to have implied that their numbers were merely additional values, available to Keys. To repeat, this precedes their own Figure 3. This is shown in Figure 3 for males aged fifty-five to fifty-nine years in 22 countries.† It is immediately obvious that the inclusion of all the countries greatly reduces the apparent association. That clearly implies cherry picking. I have taken Keys' original plot for just this age group and through the magic of screen shots and Paint, rescaled and superimposed the 6 countries from the original plot in Y&H (enhanced data points with larger red dots). Clearly if you use different data, for the same 6 countries, the association is already significantly "reduced". In the end, while Yerushalmy and Hilleboe make no attempt to hide the source of their data, they made statements that would lead readers to believe they were merely supplementing Keys' data with additional information he neglected to include. This false impression was siezed upon most prominently by Gary Taubes, who twisted the facts further, and has been repeated by others ever since. But was Taubes the first? The side by side image below, from Uffe Ravnskov's Cholesterol Myths, published in 2000, is ubiquitous on the internet. Here it is in a March 2011 post by Chris Masterjohn. Others had long since pointed out to me that the points from Figure 1A (Keys) do not overlay those from Figure 1B (Yerushalmy & Hilleboe). But why did Dr. Keys use the figures from six countries only? At that time information was available from 22 countries and if all of them were included the association was in fact rather weak. For instance, the death rate from coronary heart disease in some countries was 3-4 times higher than in countries where the consumption of fat was the same (fig. 1B). Many researchers wouldn’t buy it. Jacob Yerushalmy, who ran the biostatistics department at the University of California, Berkeley, and Herman Hilleboe, the New York State commissioner of health, co-authored a critique of Keys’s hypothesis, noting that Keys had chosen only six countries for his comparison though data were available for twenty-two countries. When all twenty-two were included in the analysis, the apparent link between fat and heart disease vanished. The reason I bring Rasnkov into this is because his plots are of higher quality than the original Y&H plot so I began with playing around with them as a substitute for the original. I was also trying to reconcile some issues with Y&H's data -- I'll get to that in a bit here -- and decided I needed to work with the original. The figures below are from what appears to be a newer ebook version. Ravnskov has updated his plots. I've screen shot this and cobbled it together a bit for display here, but it is interesting that his overlay no longer exists. However, here are some more interesting overlays. The Ravnskov data from the current Fig 1B(blue dots) doesn't match up very well at all with that of yesteryear (left), nor does it appear to jive with Y&H's data (middle). Although it's the best match of all, Ravnskov's original plot didn't match completely with Y&H's either (right). Tsk tsk. I'm not really sure what to make of all of this. I'm a bit more disturbed with some errors in Yerushalmy and Hilleboe's original data and plots, which I'll get to in a bit here. At least Ravnskov's original presentation of the Y&H data, the one that has been shared over and over, isn't too off. Ancel Keys Stunk At Cherry Picking! Alrighty then! Here's another question. Let's assume that Keys really did have access to a pool of data from 22 countries. Why would he have picked those six countries? It is often repeated, and is now published in Open Heart journal of the BMJ journal family, that Keys selected only those countries that supported his hypothesis, and he left off those that did not. But this does not even make sense! Certainly there were others, and more of them, that would have created a better fit, and an even more pronounced effect! Below right, I selected data from 14 countries (Australia, Austria, Canada, Ceylon, Chile, Germany, Ireland, Italy, Japan, New Zealand, Portugal, Switzerland, UK and US) that would have been even more convincing than what Keys presented! IF Keys had tried to use Y&H's data to his advantage, it would have been unlikely he would have chosen the same six points. This accusation is not only inappropriate and beneath serious scientists, it's also pretty absurd on its face if you look at the data. I was about to resort to guesstimating values when I noticed this table in the text. Perhaps it's just irony that in a paper/talk dedicated in many ways to minutia (not all, but some), Y&H committed a faux pas or few of their own. Note that B-26 is arteriosclerotic and other degenerative heart disease and B-27 is all other heart disease. The data reported in the Appendix is for B-26 and B-27 combined. Table II here has the categories itemized for only 13 of the 22 countries. The plot is clearly for B-26 only, so that all of the data exists somewhere. I find it odd that for this major plot to compare to Keys', Yerushalmy and Hilleboe opted not to provide the full data for all 22 countries. They bothered to itemize it for some countries. Things that make you go hmmm? In addition, they had some data to itemize the 420/421/422 classification data for the B-26 classification. Did they have this for all countries? If they did, why didn't they make a plot of that data (420 and 422, as indicated was Keys' plot). Point being, that despite harping on how it can influence the data to in/exclude different classes, and for all their seeming rigor, Y&H's data selection and presentation doesn't seem to meet their own standards. But wait! There's more. I put the data provided for categoties B-26 and B-27 separately from Table II, along with the combined data from the Appendix into a spreadsheet to create a plot. Curious to make sure it coincided, I added the values to compare, and discovered that for 1 of the 13 countries, it didn't add up. I suppose one could forgive this, but it is a pretty substantial inconsistency, and not only that, it is for one of the Keys-6 countries, namely Italy: B-26 = 428, B-27 = 40 (adds to 468) ; Reported B26+B27 = 283. Odd, no? It's only one of 13 data points, but it was Italy, and what assurances do we have that similar errors aren't lurking in the other 9 countries? Might seem nit picky but the 428 wasn't likely an issue of transposed digits of 248. All of the other combined values were within ±1. Is this an error in the WHO data or Y&H's version? To me this casts more doubt on the rigor of Y&H's analyses as we don't have ALL of the hard data they used to know. Data included in Y&H's paper is incomplete and contains at least one inconsistency. Whether or not cholesterol level, etc., are involved, it must be concluded that dietary fat somehow is associated with cardiac disease mortality, at least in middle age. 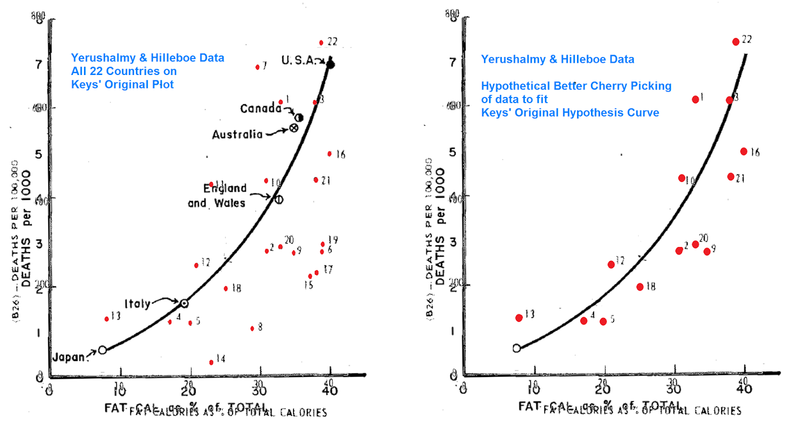 The vilification of saturated fat by Keys began two decades before the seven countries study, where Keys showed a curvilinear association between fat calories as a percentage of total calories and death from degenerative heart disease from six countries. However, he excluded data from 16 countries that did not fit his hypothesis. Indeed, data were available at the time from 22 countries, and when all countries were looked at the association was greatly diminished. 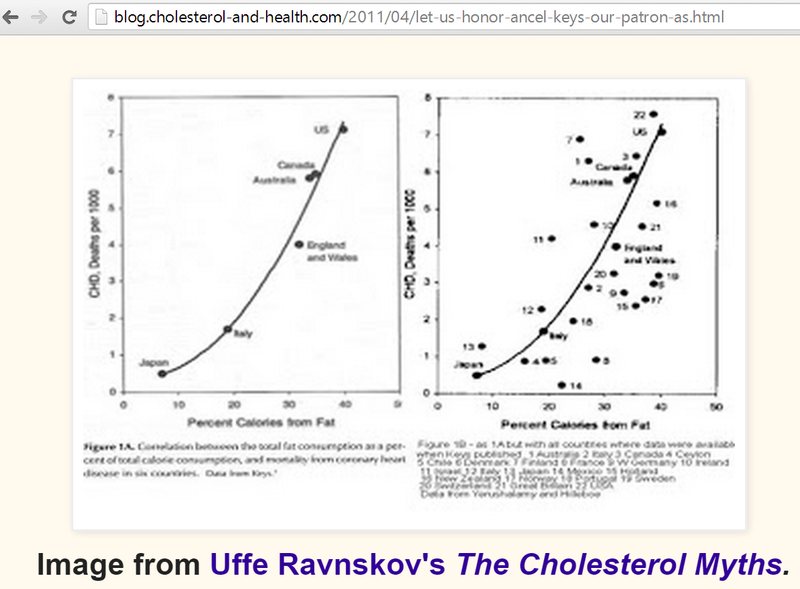 Furthermore, no association existed between dietary fat and mortality from all causes of death. Thus, past data promoted by Keys showing that an increased percentage of fat calories consumed increases the risk of death are not valid (and certainly could never have proved causation). These data seemingly lead us down the wrong “dietary-road” for decades to follow, as pointed out by others. What is the point of including the statement about all cause mortality? I could let it go, but one of the major points made by Yerushalmy and Hilleboe was that if we look at all the various categories and such, there are greater associations to be made between other dietary components and heart disease mortality. No association with all cause? True, but a greater association for animal protein and animal fat than for total fat, and a negative association for vegetable fat and carbohydrate to boot! 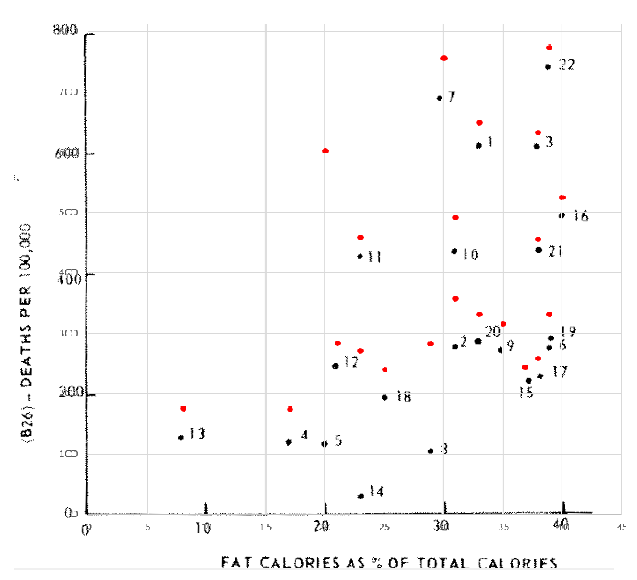 Not to mention the strongest correlation of all being for total calories. Yerushalmy and Hilleboe found a statistically significant association between Total Dietary Fat (in Calorie %) and death from Degenerative Heart Disease (B-26) in the 22 Countries for which they had data. Keys never reported a correlation coefficient, but his association was visibly greater than Y&H found for more, and different, data. Thus, past data promoted by Keys showing that an increased percentage of fat calories consumed increases the risk of death are not valid (and certainly could never have proved causation). W1hether or not cholesterol level, etc., are involved, it must be concluded that dietary fat somehow is associated with cardiac disease mortality, at least in middle age. Since I repeated that, I note once again, that what is missing is equally important. That being the word "saturated". Keys did not "begin his vilification" of saturated fats in 1953. He didn't claim cause. Alrighty then, in reverse order, Reference 5 is from none other than Principal Involuntary Content Contributor at The Carb-Sane Asylum: Mr. Gary Taubes. Perhaps to avoid anyone noticing the Keys/Y&H similarities, a 2001 Science article entitled The Soft Science of Dietary Fat, instead of GCBC. Leaving aside Taubes' confusing intermingling of almost 3 decades in time, look back at the 22 countries folks like Taubes and DiNicolantonio seem bound and determined to fixate upon. Let's look at the data just from that infamous plot. Do you notice anything? I made a pretty table for you to assist. If we substitute the 250 from the plot for Italy, the low fat group mortality rates go to 228 and 251 for ≤ 30% and below median respectively. Show me the verifiable data for high rates of heart disease amongst all these low fat consuming countries. Heck, let's go one step further, even if you average up to 33% fat group the mortality is 281 for average fat intake of 24.9%, while 35% on up group averaged mortality at 398 with 38.1% fat. 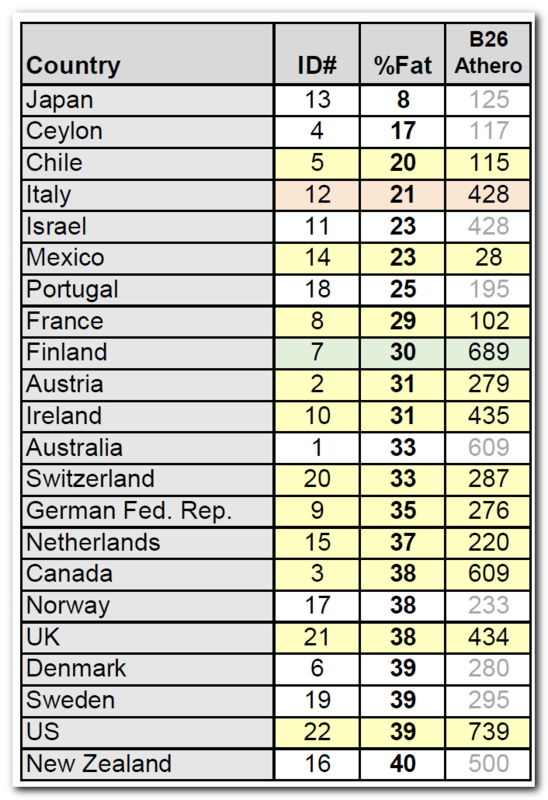 Here's the other OBVIOUS thing about these 22 Countries -- 40% was the upper end of fat intake. NOT the average or norm. Which brings us to the second citation regarding going down the wrong road. Which again ... would be the road that roughly half of a high-fat-loaded sampling of countries was already on? So the final reference is a book: The Rise and Fall of Modern Medicine by James Le Fanu, M.D., "a medical columnist for the Daily Telegraph and Sunday Telegraph as well as a writer for the Times, the Spectator, and GQ. This book must be Robb Wolf's Bible. I haven't had time to read it all, but my Cliff's Notes take away is that modern medicine was the bomb when it eradicated infectious diseases and the like, but it's made barely any progress since. Really? I realize there are issues with what has happened with medicine, systems in different countries. I recognize that everyone wants to live a disease free life for, apparently, ever and modern medicine has failed miserably at that. But I'm really kind of sick and tired of those who think anyone taking any prescription med (other than metformin, which should probably be put in the water supply) that might be extending their life doesn't have "any sort of life worth living". That's horse manure and you know it! LeFanu is not a big fan of diet causing diseases, nor conversely, apparently of altering diet as a means of preventing or curing them. He discusses this with regards to cancer, but also slips in a reference to Keys and the Japanese basically saying that if one switches their diet they may only be "switching the risk of dying from the types of cancer common in the West [and heart disease] to those common in Japan". Firstly, Le Fanu is an MD and that he doesn't know that avocados are essentially cholesterol free, is quite disturbing. Secondly, I hope everyone realizes by now, that even in his infamous 1953 paper, Keys was NOT speculating that the main cause of elevated blood cholesterol was dietary cholesterol. Reference 9 is to a 1941 publication entitled "Chinese Lessons in Medicine". But kudos are due to Le Fanu, as he is the first I've seen to mention Keys' first seminal work in this area of research: The Minnesota Businessman Study (my post on this forgotten "Other Minnesota Study") by citing the 23 year followup (Mortality and Coronary Heart Disease Among Men Studied for Twenty-three Years, Arch.Int.Med. 1971. 128:201-14 ... sadly cannot even find a link other than as a citation). Regardless, as refreshing as it is to see this study even mentioned, we are treated to yet another inventive timeline of events! Perhaps if any of you reading this is familiar with this book you can confirm or deny for me whether my impression that this guy is a bit of a consipiracy type. After a disjointed, but more fair than most discussion of the trials of Keys and his ideas, the discussion turns to cholesterol lowering drugs. This is a separate issue, but it is a hot topic that hits nerves and riles people up. However even if Americans had reduced fat intake (in total, not as a percent by upping carbs), the change is still to around 33%. Hardly some obscure lightly traveled path as dietary behavior goes. Eating more than 40%, now that would be a strange experiment indeed. 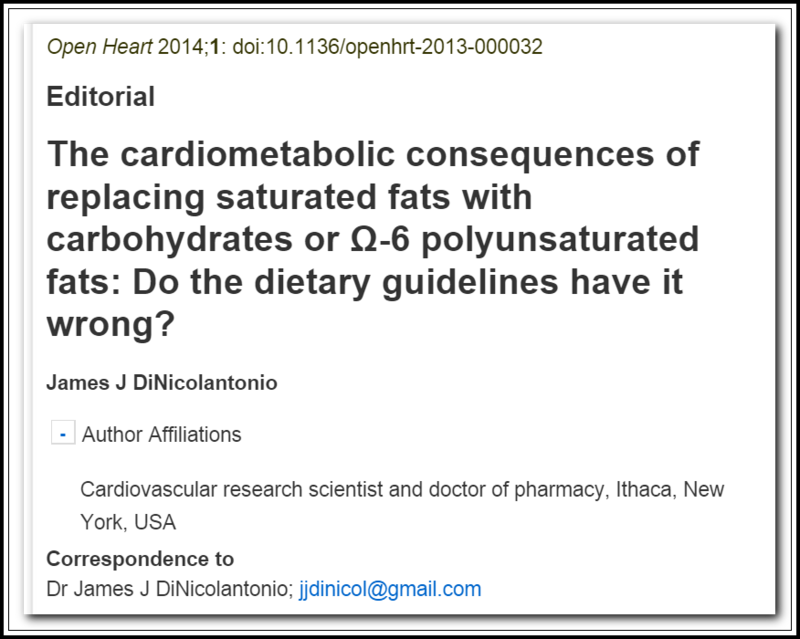 DiNicolantonio's editorial continues on in familar fashion -- saturated fats were replaced with refined carbs and crappy O6 oils, which is exactly what the dietary recommendations were, right? And look at these nominally better improvements in cardiometabolic parameters in weight loss trials, but LDL too high? We'll just become a skeptic for that, adopt another pet biomarker, make up and perpetuate still another (fluffy LDL anyone?! ), and encourage folks down a totally untested dietary path. Meanwhile they'll identify a different culprit, ignore any evidence that they are going down the wrong path, and encourage people to eat a diet that is foreign to the vast majority (one might say statistically 100%) of humans worldwide. And if/when it has deleterious long term consequences, then what will they do? Prescribe metformin? DiNicolantonio has never done any primary research. He is not a scientific researcher. He joins a long line of similar who feel emboldened to take pot shots at real researchers like Ancel Keys. What is most ironic is that these folks, seemingly to a one, have preconceived ideas of their own. Ideas they continue to advance despite being presented with existing and convincing evidence to the contrary. In DiNicolantonio's case, there is a lot more to say on that point. Much has been said about the others, but if the past is any indication, there will continue to be a steady stream of material coming my way from them as well. Is there a line of argument that the decreasing fat content (relative, not absolute) in the US diet had something to do with this? My guess is that DiNicolantonio is not old enough to have two non-overweight grandfathers drop dead of heart attacks in their 50s. But Taubes is. So is Dayspring. And so are others at the BMJ paying for this refuse disguised as peer-reviewed literature to be published. No excuse. One wonders why, given his past criticism of Jimmy Moore's lipids, Dr Dayspring has jumped on the LCHF bandwagon?? He was seduced by Gary Taubes and TWICHOO. There are YouTube videos of them together. Dayspring has been snagged by Specialty Health, which as Robb Wolf slipped up and admitted at AHS13, is busy working on an alternate healthcare delivery system that will be much more profitable. In the end, SH believes in the basics of diet-lipid, only they are woefully misguided as to the role of real-food carbohydrate in the process. Dayspring has also had a long standing financial interest in novel lipid tests. To be honest, I think Plant Positive should post under his pseudonym and also realize that I didn't ask if anyone else had ever said anything, I was merely concerned, given how my life has been over the past year, that I wasn't misremembering or repeating something I'd read by someone else. I realize it hurts his feelings, but I don't use him as an information source. I think there are some who do attribute it to that ... but on this point I think we have to remain consistent. Our diet hasn't really changed as much as the LCHF proponents would claim. 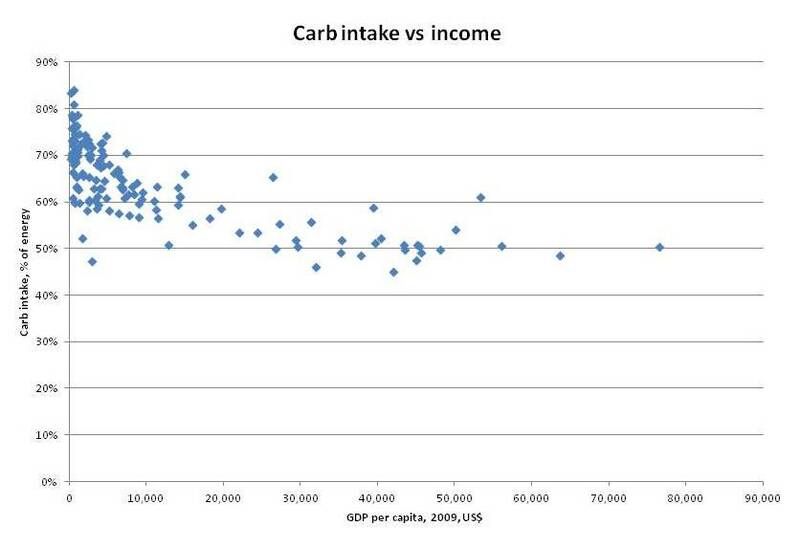 We didn't cut fat, we added carbs. It's as if my financial planner told me I need to cut back on entertainment expenses so I go out and buy a bigger more expensive car which increases my commuting expenses. Then I brag to my planner how my entertainment expenses are 40% lower than they were because they were 10% and now they are 6% of my total expenses. What do you mean by 'PP should post under his pseudonym? ', do you think I'm him? I'm definitely not lol. My comment was directed at Charles as he didn't list him as someone who had weighed in on the subject, even though his work influenced people who he did list which seemed like an important omission. I wasn't trying to imply you stole his ideas or that he influenced your work here. I'm assuming you've been attacked about something similar by a millitant vegan which is why you're defensive but I enjoy reading your work and was merely pointing out the omission from Charles' comment. Acute care for a cardiac event is a lot better. Chronic blood pressure care is better. Secondary prevention is extremely effective. We're overdoing primary prevention, but it's effective for the right people. Statins are an effective drug. That's all in the setting of greatly reduced smoking. Also, according to Evelyn, Y&H included non atherosclerotic disease. Acquired valvular heart disease is both greatly reduced due to antibiotics and treated more effectively. Atherosclerotic valvular disease (aortic stenosis) is treated more effectively. My apologies. In the past, when I've weighed in on Keys there always seems to be someone who pops in here to remind me of PP's contributions and how he was the "first". I have all but been accused of plagiarism, so you hit a nerve, and if that wasn't PP himself, it was someone with a serious bro-ro-mance going on! So I'm sorry to have jumped at you. Yes, plus so many new cardiovascular drugs have come onto the market in the latter years - beta-blockers, calcium channel blockers, ACE inhibitors etc. some having more than just anti hypertensive activity. So much of this is within my lifetime to where I don't think those even 10 years younger than me perhaps understand. The first cardiac bypass was done right around the time I was born. When someone had a bypass in the 70's it was a big deal. Even from the 90's when my FIL had bypass until now, it has become so much more a matter of routine, less risk, better success, etc. My FIL was 65 when he had his after being slowed by angina for some years prior. Once recovered, he was far more active and able to do things than before ... he helped build an entire house even! I would say he pretty much got a new heart for 10 years, started to have some issues again after that, but only really in the last few years did he have more serious issues. He died in his 80's from something different, but without medical interventions, he would likely not have lived into his 70's. It's just like the LCHF crowd adding fat instead of actually cutting protein. Eating a spoonful of butter with every bite to keep your macros right is like someone on a low-fat diet eating a spoonful of sugar with every bite to keep their percentage of calories from fat low. A certain someone translated this into eating more fat with a high protein meal and ignoring the advice on portion sizes. Diet-wise, as far as animal consumption, there was a shift from beef to poultry. It's not the only contributor to the decline, but it's a significant change. With these multiple factors in play, opportunists feel they can take liberties to downplay or even absolve the guilt of saturated animal fat in the role of atherosclerosis? Perhaps they feel the other factors will cover for a shift back to massive saturated fat consumption??? Articles like DiNicolantonio's and books like BFS should also be seen in the context of total meat consumption taking a nosedive with the Great Recession and positive publicity about plant-based diets in general, and the Beef Checkoff Program developed in response. . Adding fuel to the fire is the BMJ's predilection for controversy. The one that claims it saves $$ ??? Have I mentio ned why I call it the Incestral Health Community lately? When I first got in trouble with the despicable Robb Wolf man-child it was related to this: http://www.donotlink.com/dqio (you'll note in the comments that he goes after Charles for inquiring about the program as well). I asked a simple question on Twitter a week or so before his outburst as regards what exactly the diet was that Specialty Health was using. His answer was that he didn't know really, got the "you can call them" (why should I have to? You're promoting it as paleo, can't you give a hint?) before he finally gave a vague indication that it was a Lindeberg-esque (low fat, low sat fat) version of paleo. Specialty Health uses diet (not Bulletproof) and STATINS and other medications (metformin, etc.) to normalize lipids. Their focus in on LDL particle number when LDL-C is often normal and trigs are also high. I am pretty sure that if LDL-C is high, they are on that like Jimmy on butter. Here's what Taubes says in that video about fruit. "As Dayspring said about the potato, if you're insulin resistant then you're not doing yourself any favours [eating fruit]. Doesn't matter how many micronutrients, phytochemicals, antioxidants they have in them, they are going to stimulate insulin secretion, they're going to cause your triglycerides to go up, fat to be accumulated ..."
How does Taubes think people get to be insulin resistant in the first place? He should look up 'magnesium deficiency insulin resistance'. Or 'copper deficiency insulin resistance'. Or 'iron overload insulin resistance', or 'manganese diabetes'. These things are not really in doubt any more. Case one. This case involves a highly motivated 33-year-old police officer who, over a four-month period, has had a spectacular reversal of insulin resistance. This was accomplished with a low-carbohydrate diet, exercise, a weight loss of 12 pounds, and medication—in this case, a generic statin costing $10 every three months. The officer’s LDL dropped more than 1,200 points to ideal levels. It's somewhere in the last 5 min or so of this video that Robb slips up and discusses wanting to go around the system because it's more profitable. Looking at this graph, I have to wonder if stress was a contributor. If you think about the things that occurred in the U.S. between 1900 and 1950: WWI, The Great Depression, WWII. People complain about being under stress today, but geez, we've got nothing on those generations. I don't think I'm the first to bring this up. If I remember correctly, Malcolm Kendrick made a similar point in his book. My NMR results indicate I have the large, pattern A type of LDL with a low number of the more atherogenic small LDL particles (small LDL-P). from plasma. Increasing the residence time of LDL will cause increased LDL-P. LDLr attach to LDLs at a specific area (domain) of the apoB on the surface of LDLs. As the size of an LDL becomes too small or too large, the domains on apoB become distorted and are not as readily recognized by LDLr leading to increased LDL-P. So to promote clearance the LDL size should be mid-range – neither too small nor too large. LDLs can be separated into over 15 sizes and only those of midsize are readily cleared. The most useful way to use LDL size is to recognize that the presence of increased small LDL is a good marker of them presence of insulin resistance. How stupid are these people? "If stress itself were really a leading cause of heart attacks, surely the number of heart attacks would have risen dramatically in Europe during World War II. But in fact the death rate from heart disease fell, as people from war-ravaged countries were forced by circumstance to eat less rich, high-fat, cholesterol-laden foods. In other words, it's demonstrably better for your heart to eat a low-fat, vegetarian diet while bombs drop all around you than to enjoy your steak in peace." I've also seen a contention (with numbers) that the jump in heart disease in the US between about 1920 and 1960 coincided with a marked reduction in unrefined-carbohydrate consumption and a marked increase in animal-food consumption (with sugar intake being pretty much constant). That's interesting. About the reduction in unrefined-carbohydrate consumption in the US between 1920 and 1960. Do you think you could find that evidence? I would really like to see it. It fits very well with what happened during WWII here in the UK. White flour was banned, and sugar was in short supply. Surprising that Howard Lyman doesn't mention this. I do wonder about how stressful WWII was. My father was a fighter pilot and fought in the Battle of Britain. He was even shot down, but he only had good things to say about the war. He loved it. He never really adjusted to life afterwards, and took to fighting his family instead of Germans. It is my belief that this was more stressful than the war. I'm not at all thinking of dietary stress, but rather emotional/psychological. It's probably hard to imagine because it was such a long time ago, and we live in a very different time now. But can you imagine having your children drafted and sent off to a war that didn't seem particularly winnable at the time? And plenty of those boys came home in body bags. In the Great Depression, forget about what they were eating, it was all about just getting enough to eat, period. Can you imagine watching your children starve because you can't get enough food? I'm also thinking this stress would not have had an immediate effect, but may have had long term consequences. It may not be the entire cause, but I have to think it's a contributing factor. Exceedingly few Americans have ever lived under the circumstances in Europe (and elsewhere) during WWII (or war on THEIR soil). My Mom remembers as a child the bombers flying overhead in Germany when she was a girl. Rations, soldiers coming through town, etc. I think the stress connection is likely one of those that acts to exacerbate other causes. For example, if you're hypertensive, being stressed will make matters worse. I have to disagree here! I can see your father's case, but I doubt his experience was shared by many population-wide. FWIW, during the war my Mom tells of how they would trade rations with American soldiers for other things they needed. Well ... apparently it depends on things like whether you're on the winning or losing side, and how much support you have. We were 'plucky little Britain' fighting the Nazis all alone, for a while anyway, and my father was very good at what he did and had excellent support. Obviously, for some groups of people the war was a nightmare. It can't have been much fun for my mother, in London with two small children and bombs falling, unable to contribute to the war effort and not knowing from day to day whether she'd see my father again. Thanks, that's a great help. (4) disregard of cholesterol intake except, possibly, for a restriction to an intake less than 1 Gm. per week. While such a trial could probably not be done today, we also don't even commit as many schizophrenics as we once did, and I'm not aware that those treated on an outpatient basis are unable to give informed consent to participate in a trial like anyone else. Although Teicholz tried to portray this in an evil light in her book, I don't think this can be seen as evidence of a "dark side". I see your article mentions injecting some civil servant volunteers with malaria in a study but there is no record of it apparently? While I'm pretty certain THIS couldn't be done today, it hardly compares with witholding treatment for syphilis or other experiments on prisoners done without their knowledge let alone consent. Teicholz actually had that in her book? That's a big fat surprise to me that she even dug that far into anything. Based on what little I have read from her (twitter, self-contradicting NYT editorial), she strikes me as a Dunning-Kruger type. They don't have references in the article that I can find, but it was done by the AP so I'm pretty sure it is legit. I think they were trying to highlight that many of the unethical studies were found in journals but escaped notice by the press. I got into it on Twitter with him over the Mayo Proceedings article on added sugar being the principal driver of diabetes. Checked some of his references and was called "nit picker" because he has so many. Let's just say he is a little more accurate than Teicholz in portraying his references, but his sampling to use to support his very definitively worded assertions is inadequate at best. DiNicolantonio is an oddity. How does a 2010 Pharmacy School grad go from being the pharmacist at Wegmans to an Associate Editor of BMJ's Open Heart journal and described as a "leading cardiovascular researcher" in one of their press releases? He does not appear to have ever conducted primary research in any field. Yeah, I meant to edit my comment b/c that didn't sit right with me so I read the article again and your interpretation agrees with mine. Still, I'm not really sure that his study is on par with some of the other overtly unethical examples. I meant it more as an awareness that maybe Keys isn't the most presentable personality. It's hard for people to get past those things. The revisionists tend to have some successful ad hominem thing going against him. He seems to have been quite brusque and the really go after that. Using EasyHits4U you can earn free advertising credits by viewing other website-ads from a member base of over 1,200,000 accounts. Earn advertising credits fast with a view for view model.